Many people believe we are in a time which represents the lowest of the four ages of man called Kali Yuga. The highest of these fours said ages being Satya Yuga – the golden age, the second highest being Treta Yuga – the age of mind power, and the one above Kali Yuga, being Dwapara Yuga – the age of electricity and atoms. Kali Yuga is also known as the dark age, an era when man’s intelligence is so dense, he barely understands anything past survival and reproduction. This age is characterised by widespread war and destruction coupled with a definite lack of spiritual awareness and scientific understanding. It is reasonable to assume that we are in this age, because of the amount of strife that we see on the tv, the internet, the media and in our own lives. But, the fact that we can see the trouble in the world through televisions and the internet tells us something else. Although, war is still rife and has been rife for a few thousand years now, we are advancing in other areas. For example, in 1600, Gilbert discovered magnetic forces, in 1609, Kepler discovered important concepts of astronomy, and Galileo invented the telescope. Drebbel and Holland invented the microscope, and around 1670 Newton pointed out the law of gravity. In 1720, Gray concluded there was electricity in the human body. Since those days, we have discovered atomic power, gene technology, and space travel; we have put a man on the moon, seen all around our galaxy, created digital picture and sound, supersonic aircrafts, the internet, tiny smart phones that do everything, tablets, smart TVs - the list of developments is endless, and growing yearly. Does this sound like a world in the dark ages where Mankind can comprehend nothing but survival and reproduction? We often forget that war, disease, and poverty have been with us for a long time, but with the advancements we are making in science, along with equally significant advances in spiritual thinking, many of these horrors can be eradicated. Many people believe the world is all doom and gloom, and this convinces them that we are in the Kali Yuga, but it is not so. Yoga, arguably the greatest metaphysical science ever to be created has been spreading around the world in the last hundred years like wildfire. Due to the work of Yogis and spiritual teachers of this non-sectarian activity, like Swami Vivekananda and Paramahansa Yogananda, yoga has established itself in the West. Unlike other forms of spirituality, yoga does not demand of you an allegiance to Hinduism – although it originates from a region where this religion is practised – India; yoga in itself is not a religion as we tend to see religion – culturally, racially, and often dogmatically – yet it is a tried and tested spiritual path. Why is yoga, a science that allies all human beings together under the umbrella of spiritual understanding, experiencing such a meteoric rise? Because we are on an ascending cycle of development – we are heading back towards the Golden Age. The general feeling, looking at the development in the area of electricity, atomic power, and physics, and the surge in yoga and other non-sectarian spiritual sciences, tells me we are a young, growing world. Yes, we have made mistakes, and we still are, but there is definite development. Swami Sri Yukteswar who resided in the state of Orissa, India, was the Guru of the exalted Paramahansa Yogananda. He was also the disciple of the father of Kriya Yoga, Lahiri Mahasaya, who was himself trained in the art of Kriya Yoga by the legendary Yogi Mahavatar Babaji – who still lives in the majestic Himalayas. Swami Sri Yukteswar, in his book, The Holy Science, a book ordained by none other than the great Babaji, claimed that in fact there was an error made in the calculations of the Yugas some time ago. He states that scholars such as Kulluka Bhatta (of the previous Dark Age) had made mathematical errors, which led to the Kali Yuga being given a life span of 432,000 years! He goes on to explain how the mistake occurred. Around 700 B.C. Maharaja Yudhisthira, the king at the time, upon noticing the oncoming Kali Yuga, fled with all his wise men to the sanctity and paradise that was the Himalayas. As he left, he handed over his throne and reign to his grandson, Raja Parikshit – who was left with no wise men in the kingdom to calculate the yugas correctly. The concluding age, which ushered in the oncoming Kali Yuga, was the Dwapara Yuga. This age lasts 2400 years, but no one in Raja Parikshit’s kingdom was willing to draw it to an official close – in fear of somehow condemning themselves to the mercy of the Kali Yuga. So, they began the Kali Yuga by adding each Kali Yuga year to the departing Dwapara Yuga, thus, appearing to extend the Dwapara Yuga, and thinly disguising the Kali Yuga. Therefore, the Kali Yuga began being counted at 2401 years - after only its first year; and the trouble began. By 499 A.D. 1200 years of the descending Kali Yuga had passed, which due to the miscalculation was thought to be 3600 years (adding 1200 – the correct length of the descending Kali Yuga, to 2400 – the length of the previous Dwapara Yuga). 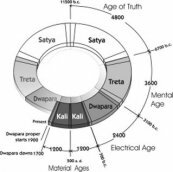 In the overall cycle of Yugas 499 A.D. was the lowest point i.e. the furthest point away from the grand centre of intelligence – Brahma. However, as the years slowly began to pass, and our solar system began to travel back towards Brahma, man’s intelligence began to grow accordingly, and the wise men of the time began to notice the mathematical error that had been made. Upon viewing the ancient Rishi’s calculations of the Yugas, they saw that the length of the Kali Yuga was supposed to only be 1200 years. One daiva year consisted of twelve daiva months, each consisting of thirty daiva days. Thus, each daiva year had 360 daiva days, and each daiva day was equal to one earthly year. So, if one daiva year equalled 360 earth years, the almanacs concluded that in earthly terms 1200 years of the Gods meant 432,000 human years. Thus, the Kali Yuga became this astronomically large figure. By Swami Sri Yukteswar’s recalculations and my lay observations of the progress of yoga, It can be concluded by Chi Kri Yoga that we are currently in the 312th year (2012) of the ascending Yuga of Dwapara – the age of electricity, atomic and physical development -In which we will gain a great deal of knowledge on the whole spectrum of electrical currents and power – as well as witnessing the continues spreading of the science of yoga. The date of 2012 A.D. can therefore be written as 312 D.A. (Dwapara Ascending) to give a full indication of our true location in the time cycle in accordance to Chi Kri Yoga and the recalculation of the yoga masters before us.